Famed photographer Jim Krantz will preview his work on canvassed classic style fiberglass chairs at this special showcase, bringing together ex-Omahans Krantz and Modernica furniture owners the Novak brothers. 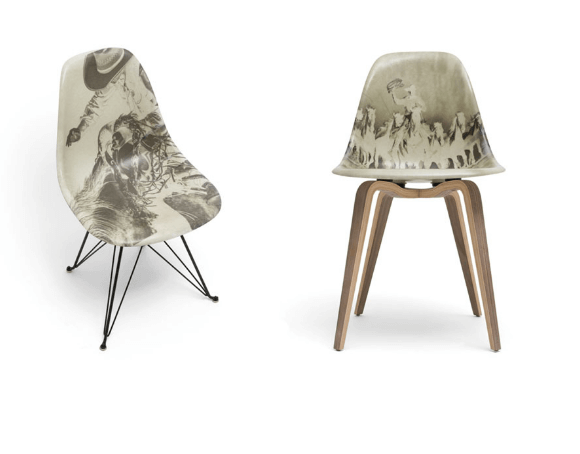 The artist’s expression of cowboys and cattle herds help personify “The Way of the West” on 8 chairs designed by Modernica,. The photos are viewed in negative form, offering an abstract presentation of the westward way of life. Krantz’ work has inspired paintings with international recognition and one photo has been recorded as the most expensive photograph ever to be sold at an auction. Presented at his family’s business, Allens Home, Krantz will be in town with the limited edition signed chairs during this exhibition and artist talk. Light refreshments will be served.